Diffusion is a vital aspect of extreme macro photography, and a good understanding of diffused light starts by looking at the lighting you're using from the specimen's point of view. You can have the biggest light bulb in the world (the sun) but it's not diffused. Size doesn't matter, the portion of the sphere round the subject it occupies matters. Put a haggle of extreme macro photographers in a room and the first thing they'll talk about is the lenses they use. The second thing that they'll start comparing is diffusion, the materials and means, and the holy grail of the perfectly diffused extreme macro diffuser. This is an imaginary pingpong sized sphere round a subject. Well diffused light sources like the top one occupy a large part of the area round a subject and light arrives at the subject from a variety of angles, whereas harsh light sources like the two below come from a small "pin" source, and therefore parallel rays, from the same direction, making shadows. Tastes differ, but generally shadows are not great. This is a huge concept in extreme macro photography lighting, especially with subjects such as insects which often have a shiny carapace. Harsh light really doesn't work well at all because specular highlights are reflected back, show in the image and the shadows are very dark. Consider a fly at the centre of this imaginary sphere. The light through a diffuser, close to the fly and mounted above, will cover a large part of the imaginary sphere and thus arrive at the fly from a large variety of angles (ie not parallel), creating nicely diffused light. The diffuser has become the light source rather than the small flash head that sits behind it shooting through. This is like a pingpong ball on a very small subject. Without a diffuser, a flash unit just has the front of the flash as its light source, and therefore the light is a very small source - even if you cover it with a soft plastic flash diffuser the same size. What actually matters is the arc of your light source on the imaginary sphere, relative to your subject. Flashlights, even covered with a semi translucent flashead sized diffuser, actually isn't that much better, as shown. But something like half or 2/3 of a pingpong ball covering the whole sky and some of the subject - now that's nice extreme macro diffusion. Horizontal rig with macro diffuser. In extreme macro it is common to use direct diffusion, ie a flash with a diffusing material in front of it. All this does is push the light from the flash head through the diffuser material and in effect the diffuser material becomes the light source. Once you get that and the idea that the bigger the angle of the light source from the subject's perspective, the better the diffusion, then you get diffusion. Most explanations of diffusion relating to photography are poor. At its core, diffusion is merely spreading out your light source so that the light source doesn't create a noticeable hotspot but instead covers the subject with even, diffused lighting coming at your subject from a variety of angles. Diffusion can either be direct or reflected. Reflected diffusion usually involves a large circular panel, which is usually silver (harshest reflection), white (softer than silver) or a shade of colours. In portraiture, for example, a gold diffusion panel works extremely well to bring a nice rich tone to portraits. In extreme macro, however, it is much more common to use direct diffusion, ie a flash with a diffusing material in front of it. All this does is push the light from the flash head through the diffuser material, so in effect the diffuser material becomes the light source. We use these in field macro and in studio work, all manner of things from a pingpong ball to paper and textiles. Diffusion is easily misunderstood and confused. White material over a flash does create a more diffuse light source but is not necessarily diffused light, especially if it is far away from the subject. As a generality diffused light in extreme macro really means light from all sorts of angles ie a sphere or hemisphere of light coming to the subject, not just a small flash far away. When you use say a 2/3 or 3/4 pingpong ball round the subject, from the subject's perspective the surface of the pingpong ball actually becomes the light source, so it gets to the subject from all angles. I hope this is clear, please comment if not. This is a concept tricky to explain but important for the understanding of diffusion. Once you 'get' diffusion as a photographer, your work will come in by leaps and bounds. Diffusion is not only vital to cut out the flash highlights of extreme macro, but also has a vital role in portrait and product photography, and even in film. At their core, the concepts are exactly the same though, so learning about diffusion is a must in anyone's path towards better photography. Regardless of which diffuser you buy, there is one absolutely fundamental point that you must consider when thinking about diffusion, which is to think about it from your subject's point of view. In other words, imaging your subject enclosed by a wireframe sphere between the subject and the light sources used on that subject. Then consider what percentage of that sphere is diffused light. A bare flash looks harsh because on that sphere, it is a pinprick. Diffused light looks soft because it occupies a large part of that sphere. A small diffuser placed close to your subject will look softer than the same diffuser placed further away. Bouncing a bare flash against a ceiling creates softer light because the whole ceiling becomes the light rather than the direct small flash head. 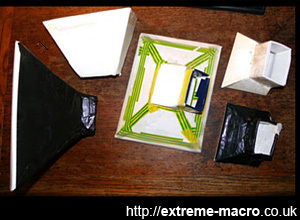 A few macro diffusers. There is a healthy tradition of building your own diffusers in photography circles, and I am no exception. When you're shooting extreme macro out in the field, seeing those harsh specular reflections of a bare flash reflected in your shot just isn't nice, and photographers go to all manner of lengths to avoid them. There is a healthy tradition of building your own diffusers in photography circles, and I am no exception. I have boxes and boxes of the damm things. Given the importance of diffusion it is actually quite surprising that there are no recognised means to measure diffusion. Industry, however, comes to the rescue, and I have borrowed some principles from industry to document the various ways of judging materials for diffusion that I find helpful when assessing whether something is good or bad. Diffusion actually has various components that it can be broken down into, and these are useful bits of knowledge to have up your sleeve. Closely related to measuring diffusion, with all the extreme macro photography using diffusion that is done, it is quite remarkable that there is no established simple way to actually test diffusion before the image is taken, and there is a way to show diffusion that costs almost nothing. I do this before every extreme macro image I take. It helps me, so you may find that using this helps you as well. I use a simple black pin. I think it's worth emphasizing that while there is overlap between the object of diffusion in macro and regular photography, the goals are not the same. Specular reflection simply isn't a big issue in normal photography, and it's pretty much THE issue in macro diffusion. In both you often want nice even softish, somewhat directional lighting. But in portrait photography, for example, you might add an eyelight for some specular highlights. In macro, you avoid them like the plague and need wrap around style diffusion. Well, no rules without exceptions. I once made a studio stack of a wood louse where the eyes were just grey and dull beceause of very effective diffusing. After directing a tiny LED flashlight with a well used battery directly towards the eyes I just got that little star light that made the eyes look alive. Much better. Excellent reading stuff! It will take me hours to go through all the resources here, but it's dreary weather out there, so I've got some time...:) Thanks a lot! !